Sign up for Broadjam today to follow Majic Conner, and be notified when they upload new stuff or update their news! Consists of 7 uptempo & 7 ballads. Styles range from Latin, Progressive, & Rock to pop Disney like balads & worship songs. All the lyrics are very encouraging & uplifting without being religious. This mix of styles is definitely something unheard of in Christian music. 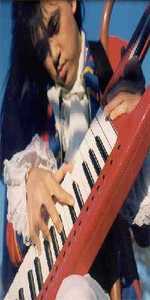 The progressive songs have some pretty flashy keytar playing, so be prepared to be blown away by lightning quick keytar chops.